Swag™~ This fragrance has such a unique twist that we just had to share it with you. It is strong and additive! Sweet creamy vanilla is decorated with fresh juicy strawberries and hot from the tropics freshly grated coconut. A true delight for those tropic lovers. Wonderful in candles and perfume. Pillage this treasure for your own! Avast ye landlubbers! 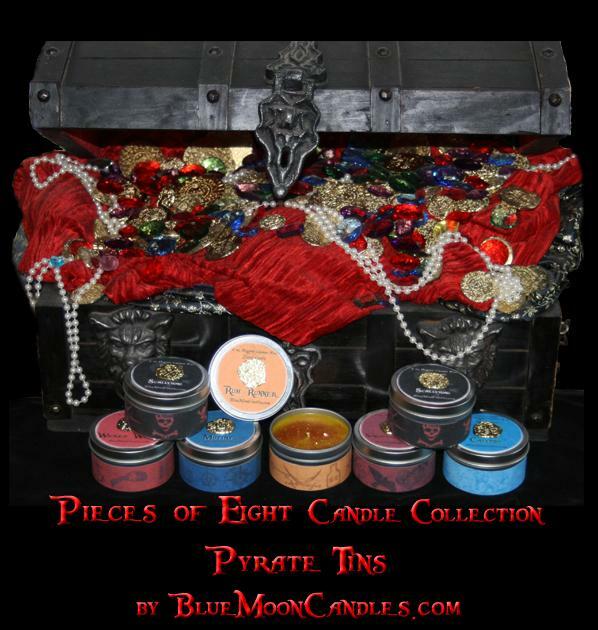 Set your one good eye on Blue Moon Candles ☠ Pyrate line ☠ *Pieces of Eight ! We have searched to World’s End and beyond to bring you the finest fragrances to set the mood weather it be a peaceful night in with your Corsair, or a wild night of pillaging…or both! Beef & Bean Chile Verde-it’s whats for dinner! Do you get tired of trying to come up with quick, low calorie, healthy yummy ideas for dinner? Well, so do I – this recipe is as good as I hoped! Cook beef, bell pepper and onion in a large saucepan over medium heat, crumbling the meat with a wooden spoon, until the meat is browned, 8 to 10 minutes. Add garlic, chili powder; cook until fragrant, about 15 seconds. Stir in salsa (or sauce) and water; bring to a simmer. Reduce heat to medium-low, cover and cook, stirring occasionally, until the vegetables are tender, 10 to 15 minutes. Stir in beans and cook until heated through, about 1 minute. We serve ours over baked tortilla chips. Rice would be yummy too! And a side of Cornbread if I dare to dream. As a teenager I was eclectic. Some say I still am. I had long dark brown hair, and almost black eyes, and gigantic white teeth almost too big for my face. I preferred dark clothes *still do* and always had my nose in a book. I was on the thin side, average height. Loved high heels though, still obsessed with them. I never thought I quite fit in, but looking back, I think I did somewhat. I always had a smile, and found quite a few opportunities to get into mischief. *still do*. In production today: Amande Creme’ Candles! Rosewood and Musk~ soft, sweet and comforting. Have you ever thought about making your own Essential Oil blend for happiness? Sweet Orange oil has a sweet and tangy smell to it. Just uncorking the bottle and inhaling the sweet scent makes me immediately feel it’s warming, uplifting properties. Some but not all properties of orange essential oil are anti-depressant, anti-inflammatory, antiseptic, antispasmodic, diuretic, sedative and tonic. Aromatherapists use this oil for treatment of depression, anxiety, moodiness, stress and frustration. The oil is known for it’s uplifting quality and tends to make a person more cheerful when used. You can mix several drops into a jar with Sea Salt for a heart lifting bath, use in a diffuser to uplift the spirits of the entire household or make your own nontoxic dryer sheets, sprinkle a few drops of oil into potpourri to improve the fragrance. Scent of the week…Summer Scents on Saturday! Ahhh not much is better than a brand new fragrance! (At least not if you are an addict like me*). Each Saturday we will feature a New or Very popular fragrance so you can get an idea of what is HOT here at Blue Moon Candles. Craving something really different? Try combining the sweet heat of crystallized ginger with the cool, suave richness of Italian Ice. At once, this is a fresh comfort food scent, a tantalizing perfume and guilty pleasure all around! The luscious scent opens with base notes of Tolu Balsam, Amber, Musk and Sweet Cream. A heart Vanilla and Sweet cream, is quickly punctuated with lashings of crunchy crystals of Cane Sugar enveloping Hot Ginger. The slightest hint of Italian Lemon and Anisette rounds out the composition.